A new study has found that people who received a flu shot before the outbreak of the 2009 H1N1 pandemic were more likely to catch the swine flu virus, a startling discovery given the fact that experts have blamed the pharmaceutical industry for deliberately engineering the pandemic to make huge profits from vaccines. “Researchers, led by Vancouver’s Dr. Danuta Skowronski, an influenza expert at the B.C. Centre for Disease Control, noticed in the early weeks of the pandemic that people who got a flu shot for the 2008-09 winter seemed to be more likely to get infected with the pandemic virus than people who hadn’t received a flu shot,” reports the Vancouver Sun. Despite the claim that the link was only related to Canadians who had received the flu shot, Dr. Skowronski was able to re-create the results in ferrets. Giving half the ferrets the 2008 seasonal flu shot and the rest a placebo injection, eventually all the ferrets were infected with the pandemic H1N1 virus. Despite the results of the experiment, Skowronsk still bizarrely encouraged people to get the flu shot. According to the CDC, the 2009 H1N1 outbreak killed as many as 400,000 people – although others dispute this figure. 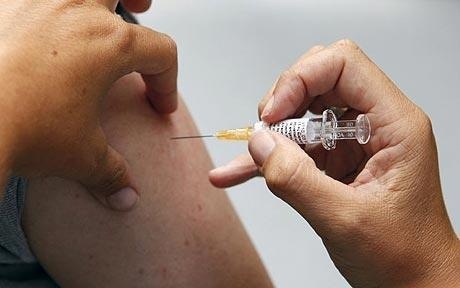 Confirmation that the seasonal flu vaccine could very well have been the cause of the H1N1 outbreak or at least helped it spread validates the testimony of experts like former Chair of the Council of Europe’s Sub-committee on Health Wolfgang Wodarg, who in February 2010 told the Alex Jones Show that the pandemic was manufactured by pharmaceutical companies in league with the World Health Organization to make vast profits while endangering public health. Initial reports that the swine flu bug was a never-before-seen intercontinental mixture of human, avian and pig viruses from America, Europe and Asia prompted theories that the virus could have been synthetically manufactured in a lab. Swine flu vaccines have also been linked with outbreaks of narcolepsy, as well as other disorders including Guillain-Barré Syndrome as well as dystonia, a paralyzing neurological disorder. Listed below are links to blogs that reference this entry: New Study Finds Link Between Flu Shot, H1N1 Pandemic. This page contains a single entry by Toni published on September 11, 2012 3:34 PM. 18 Causes of Mineral Depletion was the previous entry in this blog. Are Your Bones Aging Faster Than You Are? Busting The Myths On Building Strong Bones is the next entry in this blog.